The details behind Clear packaging made from recycled materials. Our foil pressing equipment has enabled us to expand our offering to include pressed foil wrapping. 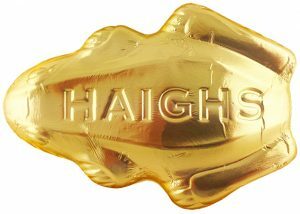 The ultimate solution to present your foil wrapped item, pressed foils can be printed in one or more colours and provide excellent moulded detail. Contact us today and we will advise you on how to enhance your foiled packaging now. Creative and cost effective packaging solutions for your foiled chocolate products. Ready to make your products stand out?